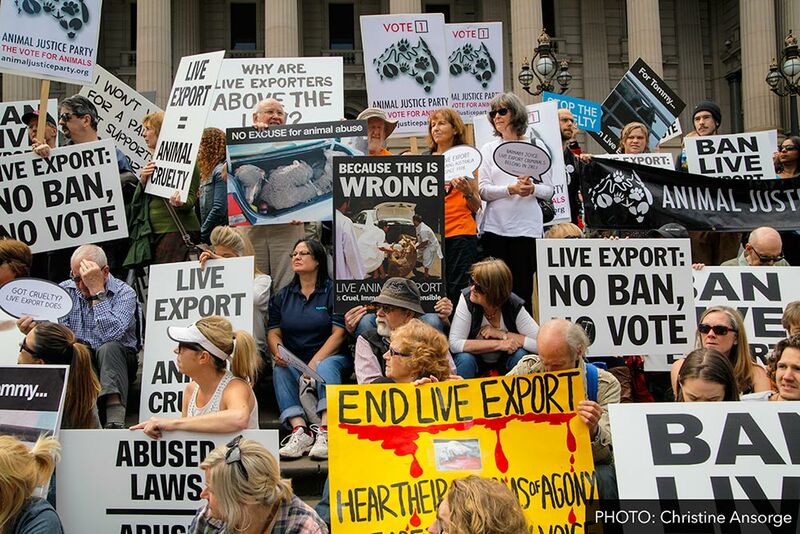 Australians rally for live export justice! Hearts and voices united for animals! 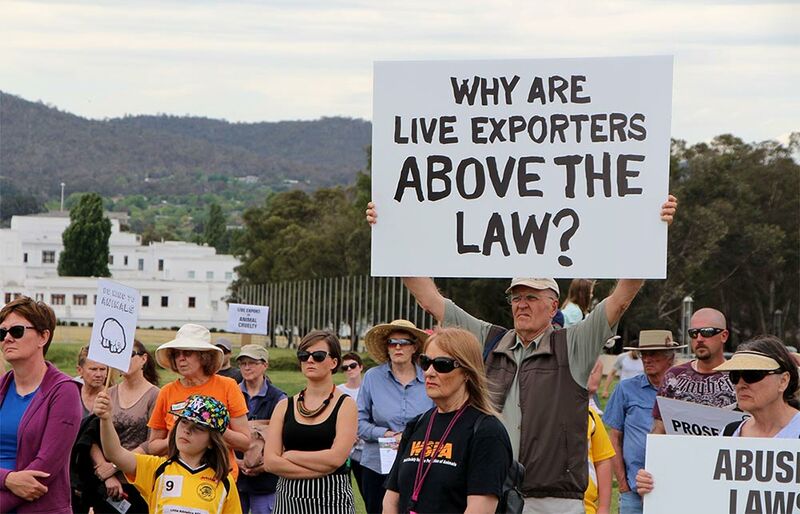 Thousands of Australians rallied in capital cities on Saturday, calling on the Turnbull government to act on the cruel live export trade & punish export companies breaking the law. From the bottom of our hearts — and on behalf of millions of live export victims — THANK YOU! Our national rally on Saturday 17 October was massive, with events in Melbourne, Sydney, Brisbane, Canberra, Adelaide, Fremantle and Hobart. Compassionate residents of Townsville and Grafton stepped up, too! This huge groundswell of public support for an end to this cruel trade sparked a flood of media reports from news outlets including Channel 7, Sky News, Channel 9, ABC, SBS, the Sydney Morning Herald, The Courier-Mail, The Hobart Mercury, The Adelaide Advertiser and The Daily Telegraph. Politicians around the country have received the message loud and clear that Australians simply won't stand for law-breaking or cruelty to animals. In Melbourne: Lyn White, Kelvin Thomson MP, Adam Bandt MP and Dr Liz Walker, with MC Josef Brown; In Sydney: Shatha Hamade, Mark Pearson MLC and Senator Lee Rhiannon, with MC Clare Mann and coordinators Debbie Blundell and Lynda Stoner; In Brisbane: Mandy Paterson, Ruth Hatten, and Andrew Bartlett, with MC Rick Allport and coordinators Sue Clarke, Shane Simms and Gayle D’Arcy; In Canberra: Glenys Oogjes, Dr Bidda Jones and Prof. Steve Garlick, with MC Tara Ward and coordinators Clare O’Sullivan, Nik Ferrara and Ash Robertson; In Adelaide: Tim Vasudeva, Tammy Franks MLC, Aaron Timoshanko and Tony Zappia MP, with MC and coordinator Sally Sutton; In Fremantle: Melissa Parke MP, Mayor Brad Pettitt and Lynn MacLaren MLC, with MC and coordinator Katrina Love; In Hobart: Andrew Wilkie MP and Cassy O'Connor, with MC & coordinator Suzanne Cass. 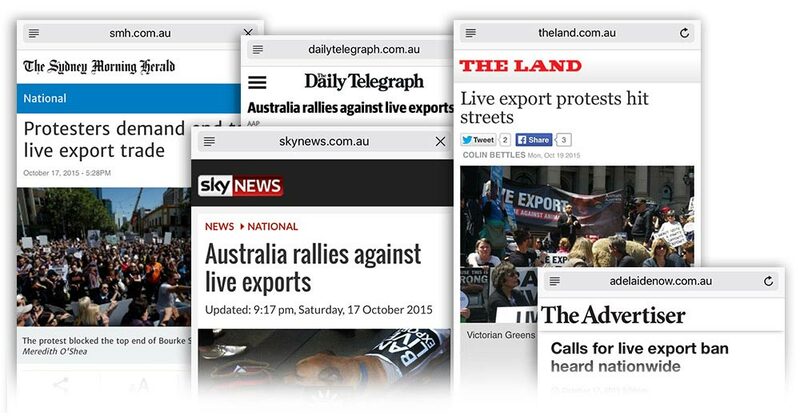 Keep the rally going by making sure your MP knows where you stand on live export law-breaking and cruelty! Call your MP now — it's as simple as leaving a polite message supporting an end to live export and asking for exporters breaking the law to be prosecuted.